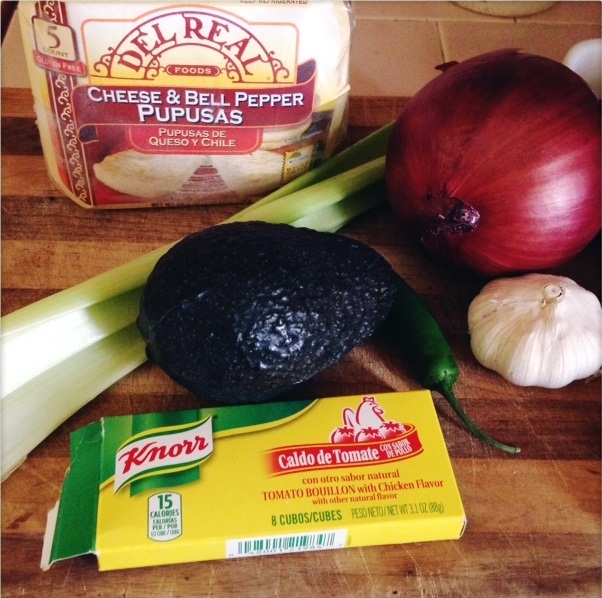 This is my second year participating in the Del Real Foods food blogger recipe contest. Last year, I was lucky enough to have been selected by the company to make a video for my Chipotle Chicken Tortilla Soup recipe, even though I wasn’t a winner. It was so much fun! Anyway, it didn’t take much for me to become a fan of Del Real Foods. Their products are all minimally processed – for example, chicken and pork that is marinated and fully cooked, but without all of the additives (and tons of salt) that you typically find in premade, frozen “convenience” foods. This year, I hope I win the contest, instead of just making a video! I am a huge fan of pupusas (I’ve made my own before), and the Del Real brand pupusas are really delicious. 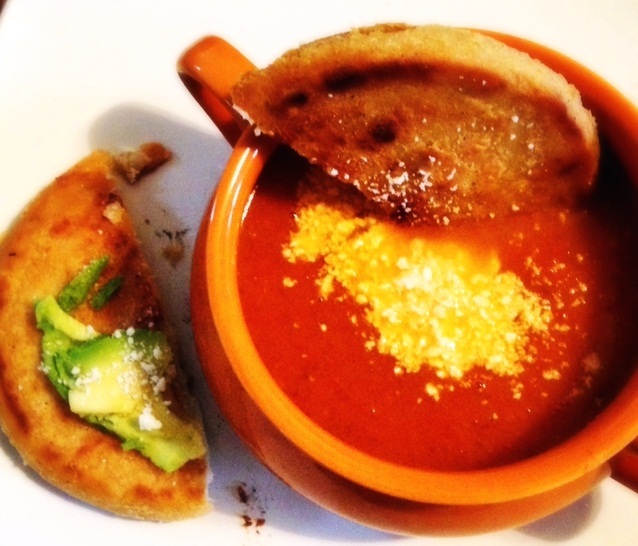 Since a pupusa is basically a handheld, self-contained grilled cheese sandwich, I decided to do a Mexican-style play on the typical grilled cheese sandwich and tomato soup combo. If you can, try to use fresh tomatoes. You can use canned tomatoes if necessary, and it will still be delicious, but the extra sweetness that comes from a fresh tomato is a perfect compliment to the spices in the soup. 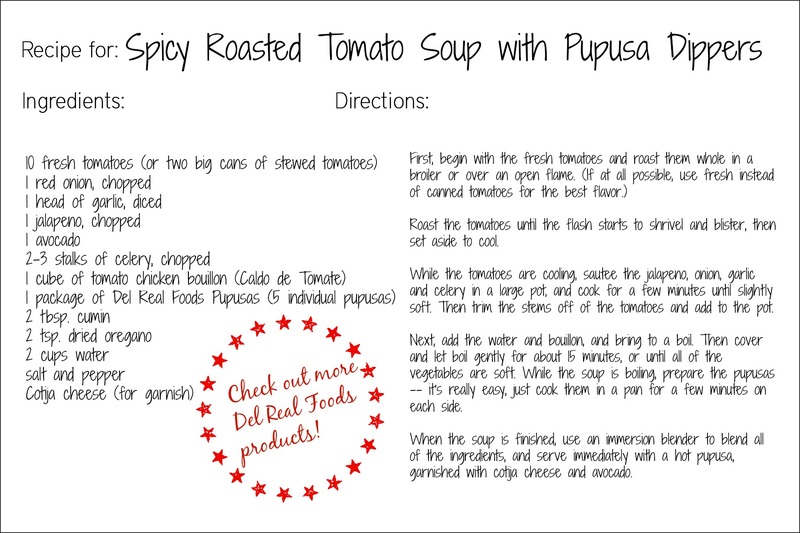 And don’t be afraid of that whole jalapeno pepper — this soup is a little spicy, but it compliments the pupusas perfectly! 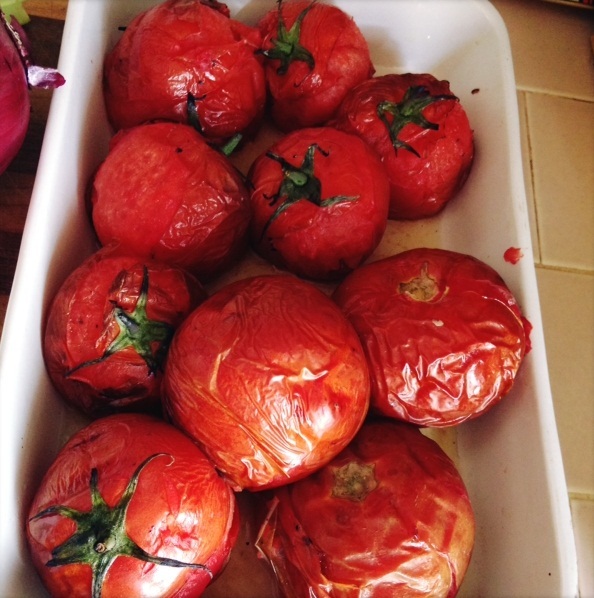 Roast the tomatoes until the flesh starts to shrivel and blister, then set aside to cool. 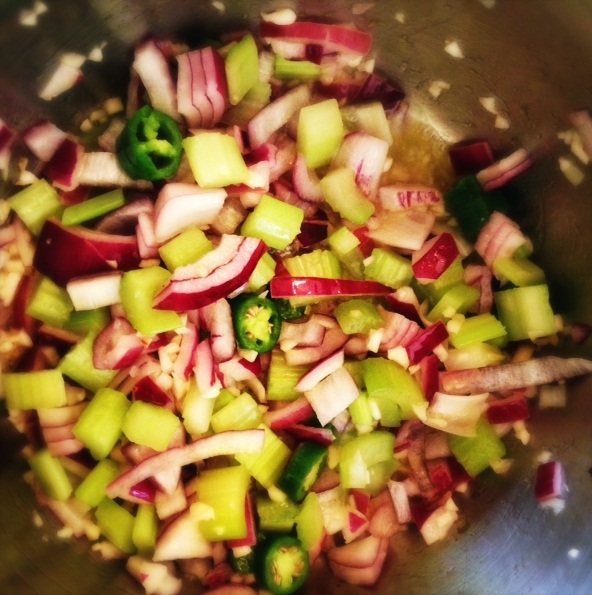 While the tomatoes are cooling, sautee the jalapeno, onion, garlic and celery in a large pot, and cook for a few minutes until slightly soft. Then trim the stems off of the tomatoes and add to the pot. Next, add the spices, water and bouillon, and bring to a boil. Then cover and let boil gently for about 15 minutes, or until all of the vegetables are soft. 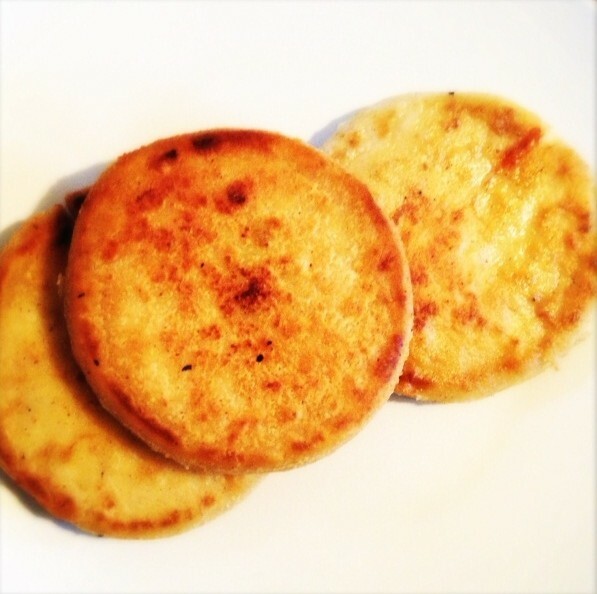 While the soup is boiling, prepare the pupusas — it’s really easy, just cook them in a pan for a few minutes on each side. When the soup is finished, use an immersion blender to blend all of the ingredients, and serve immediately with a hot pupusa, garnished with cotija cheese and avocado. Save or Pin the recipe card! Disclaimer: I was provided Del Real Foods products free of charge as part of the food blogger contest, but received no other compensation, financial or otherwise, for this post. The opinions expressed herein are my own. 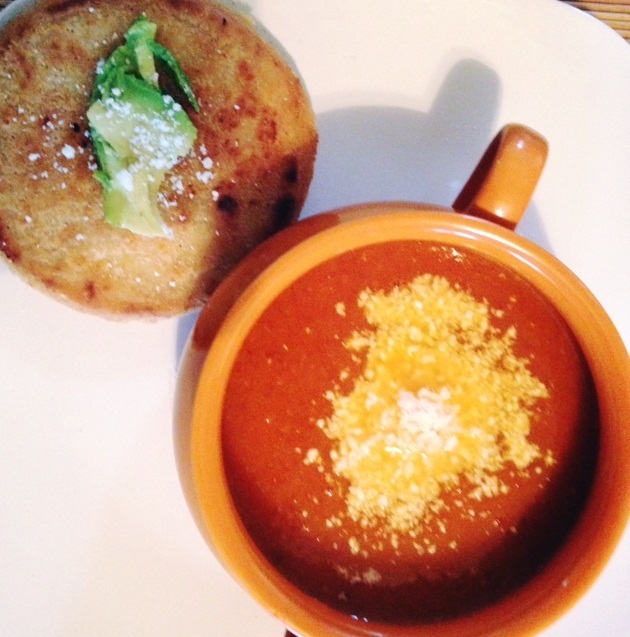 This entry was posted in brunch, contests, cooking, Del Real Foods, food, holidays, leftovers, Mexican food, October Unprocessed, soups and stews, sponsored posts, Uncategorized, unprocessed, vegan, vegetarian and tagged brussels sprouts, Del Real Foods, Del Real Foods Recipe Challenge 2016, pupusas, Spicy Roasted Tomato Soup, tomato soup with fresh tomatoes. Bookmark the permalink.